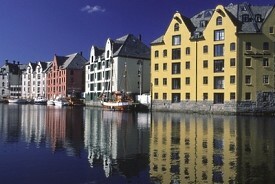 Located in the heart of Norway, this art nouveau town is known for its unique architecture. Enjoy browsing for Norwegian handicrafts and knitwear with the distinct Norwegian design or pick your own fresh lobster at one of the local seafood restaurants. The Atlantic Sea Park offers fishing stands, hiking trails, places to sunbathe, large aquariums and outstanding diving venues.